A volleyball match, a visit to an orphanage and a night on the town - it was all a bit different from the last time US servicemen were in Ho Chi Minh City, which was then called Saigon. A group of American sailors has been helping community and charity projects in Vietnam's second city, which was the headquarters for US forces during the Vietnam War. The sailors have come ashore from the US frigate Vandegrift, which on Wednesday became the first American warship to dock in Vietnam since the conflict ended in 1975. "It is an honour for the crew of the Vandegrift to be the first US ship in Vietnam for quite some time," Lieutenant Commander J.D. Gordon, spokesman for the US Pacific fleet, told BBC News Online. "It is a rare opportunity and they are thrilled... this is a continuing step in the normalisation of relations between the two governments," he said. A trip to an orphanage was one of the first stops for the sailors. They handed out sweets and toys to children at the centre, which cares for about 300 orphans, from new-born babies to teenagers. "Before 1975, if they came here, the Vietnamese people would be very scared," said Ho Thi Kim Thoa, deputy director of the centre. "This time they come to promote good. You can see the American soldiers love the kids," he said. One of the sailors, Antonio Pagoaga, 26, from El Paso, Texas, brought footballs for children. "I am having a blast," he said. "At least we can do something good. Now I can go home with a personal satisfaction." Other sailors dug the foundations for a kindergarten and painted a school as part of their work on the community relations campaign. But along with working hard to win the hearts and minds of the Vietnamese people, there has been time for some rest and relaxation, or 'R and R' as it was known during the Vietnam War. 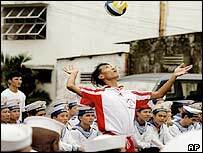 That has included a defeat for the Americans on the volleyball court - a team from the USS Vandegrift lost 2-0 to players from the Vietnam Navy Technology School based in Ho Chi Minh City. And several of the sailors appeared so relaxed in their latest port of call, that they could enjoy a carefree night on the town. Several of them were spotted drinking beer and dancing the night away in Ho Chi Minh City's 'Apocalypse Now' bar, a favourite spot for American tourists, named after a film about the brutalities of the Vietnam War.